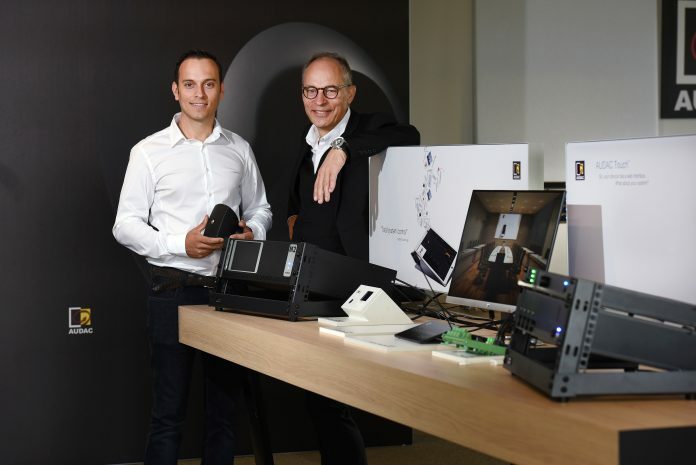 Founder and CEO of Belgian pro audio manufacturer PVS, Patrick Van de Sande, announced that his son Tom will succeed him as CEO. This was presented to the public during the celebration of the 35th birthday of PVS. The company is also finalizing an investment of 12 million euro in new buildings for R&D, Quality control and distribution in Stevoort, Hasselt. A few years ago, PVS already invested heavily in its own experience centre at the Veldstraat in Hasselt. In the meantime, the company has bought the buildings and terrains of a former transportation company in Stevoort, Hasselt. The own brands AUDAC (Audio equipment), PROCAB (cables & accessories) and CAYMON (flight cases and racks), all developed in Hasselt are finding their way to 83 countries. The past few days, the company celebrated its 35th anniversary along with over 200 clients from all parts of the world. On this occasion, father Patrick (60) announced that he would pass on the torch of CEO to his son Tom (32). “I worked sixteen hours a day, day in, day out. That became too much”, Patrick explains. But he is not all alone right away. Father, Patrick, remains on board as technical director (CTO). Meanwhile, PVS still has big plans for the future. Due to the rapid growth, they will have to move their headquarters in the long term. At the current location in the Veldstraat in Hasselt there is no room for expansion. “By 2025 we will move everything to our logistics centre in Stevoort. At our new facilities there is plenty of space available to ensure we can keep expanding by offering innovative solutions to the AV market,” the brand-new CEO announces.